"Push your musical creativity in a fresh new direction"
Torsion: ready to twist your sound in a new direction? 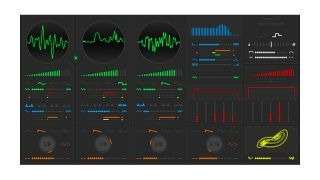 Sinevibes' synths all share a distinctive look, and the company believes that Torsion, its new release, has a pretty distinctive and original sound, too. Superficially similar in structure to a common or garden subtractive synth, Torsion differs in that its three oscillators produce additive waves based on just a few partials. You can then add new spectral content using a technique called waveshape modelling. Other features include a ring modulator and an audio-range oscillator for filter FM, plus four separate LFOs, two AHDSR envelope generators and a two-dimensional 'chaos oscillator' for wide-ranging modulation possibilities. Specs below - you'll find audio examples on the Sinevibes website. Torsion costs $49 and a demo version is available.